Vinnie Badinehal is a great supporter of the Eller College and has been personally involved in helping many Eller students start their careers in finance. 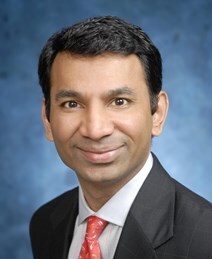 After graduating from high school, Vinnie moved to the U.S. from Mumbai, India and earned his bachelor’s degree with a focus in international business from the Eller College in 1992. Following his graduation, Vinnie started his career in international marketing for General Electric. Vinnie later earned an MBA from the Wharton School at the University of Pennsylvania where he was an Emerging Economies Fellow. At Wharton, he was the founding chairman of the Wharton-India Economic Forum and currently serves on the advisory board of the forum. Vinnie became interested in investment banking during his MBA program and, following graduation, started at Merrill Lynch where he covered financial institutions for over a decade. He later worked as Managing Director and Head of the Financial Institutions Group in the Americas at Deutsche Bank. The key to every individual’s success is hard work and humility, in addition to building good relationships with people and mentors. Always do the best job you can, knowing that we don’t necessarily control the final outcome. Always be positive, lead by example, do the right thing, and stay strong to your ethical roots in whatever you do. I am very appreciative of the role UA and Eller played in my overall personal growth at a critical time of my life and therefore have tried my best to give back. I started giving back by supporting the annual fund and helping to recruit Eller students. A few years ago, I was asked to support the new Professional Development Center and it has been great to support the growth of the programs and students.